Oct. 15, 2014 10:00 p.m.
Do you know someone who canâ€™t make much-needed house renovations, due to financial and/or physical limitations? If so, then itâ€™s time to try to make a difference. 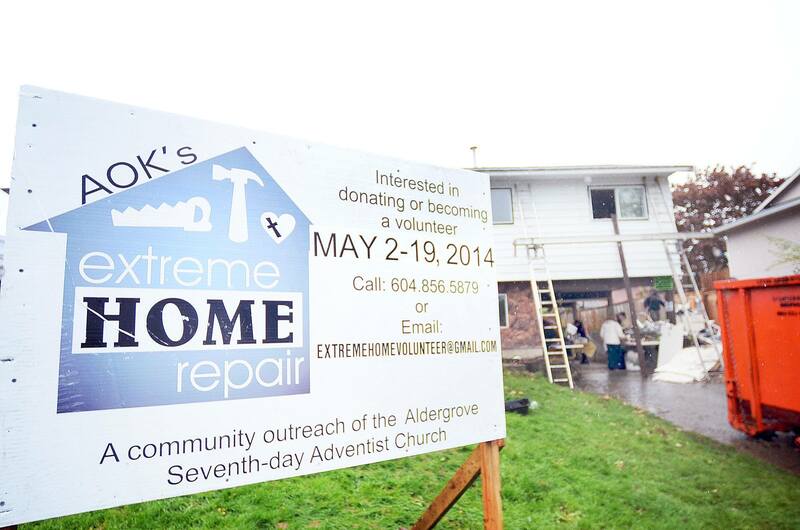 Nominations for the 2015 Acts of Kindness (AOK) Extreme Home Repair project, organized by the Aldergrove Seventh-day Adventist Church, are being accepted. Nomination forms can be filled out and submitted online by clicking here. Nominees must live within the Langley/Aldergrove area limits and the deadline for nominations is Nov. 15. Volunteers will start renovating the home in early May, 2015, for a Victoria Day (May 18) reveal at 5 p.m.
A home will only be selected if it is felt that the owner(s) cannot reasonably complete the needed repairs on their own, due to physical and/or financial limitations. After Nov. 15, the nominees are contacted first via a phone visit, which starts the process, and then by a visit to the home. â€œAs always we are looking forward to making another difference in someoneâ€™s, or familyâ€™s, life,â€ Brownmiller said. This past May, more than 200 volunteers did a complete renovation of Pat Tapperâ€™s split-level house in Aldergrove. The estimated cost of renovations ranged between $150,000 and $200,000 in value. Each year brings new challenges, Brownmiller said. But the payoff comes on the day when the homeowners return to see their renovated house for the first time in a couple of weeks. And Brownmiller added that itâ€™s always worth the time, effort, and sacrifice. Brownmiller loves the pay it forward aspect. The difficult, and at times heart-wrenching part is, narrowing the list of nominations to one.